The election isn't over until it's over. Still, even though the corporate media are actively tipping the scales in Donald Trump's favor, his path to the presidency is defined by a very unlikely set of electoral circumstances. The media want a horse race, so a new Bloomberg Politics poll of likely voters in Ohio, showing Trump with a 5-point lead over Hillary Clinton, is getting a lot of attention. However, as with any individual poll, this is just a snapshot of one moment in time. The average over time still shows Clinton with a 1-point lead in Ohio. Ohio is a battleground state, which makes any news of a Trump lead even more enticing or worrying, depending on your perspective. But Ohio is still only one piece of a larger electoral puzzle. And even if Trump were to win Ohio, he would not be guaranteed the presidency. To win, he would need to win every red-leaning state—as well as all three battleground states: Ohio, Pennsylvania, and Florida. Or he would need to win every red-leaning state, two of the battleground states, plus pick up wins in blue-leaning states. Neither of those scenarios appears likely at this point, especially with four red-leaning states in play: Arizona, Georgia, Missouri, and North Carolina. If Clinton wins even one of those, Trump can't win, even if he wins all three battleground states. Clinton, on the other hand, only needs to win the blue-leaning states plus one of the battleground states. And given her lead in Pennsylvania, this is a much more likely outcome. To evaluate how likely that outcome is, I ran a simulation with Pennsylvania in play, meaning either Clinton or Trump could win the state. 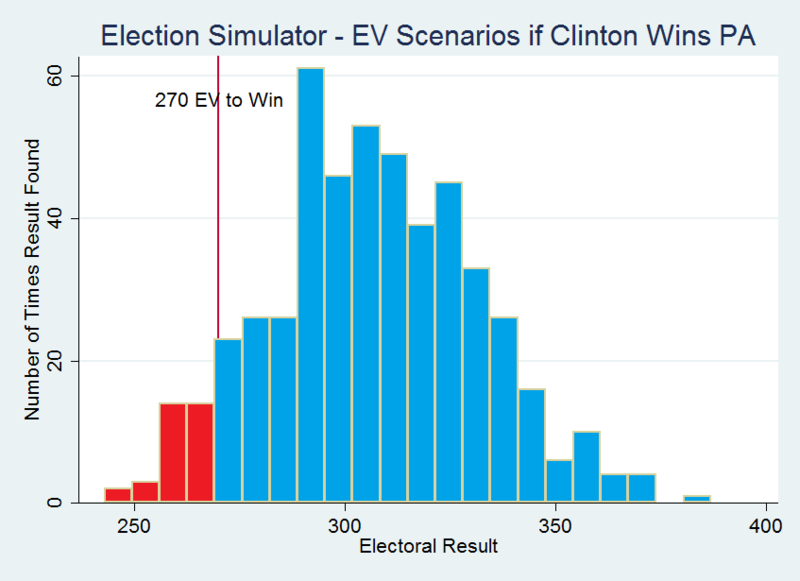 In a simulation of 500 different possible election outcomes, based on current polling, and allowing for varied combination of wins, Clinton wins the election in 427 of them, or 85.4% of the time. And to evaluate how likely it is that Clinton wins the election if she definitely wins Pennsylvania, I ran another simulation. 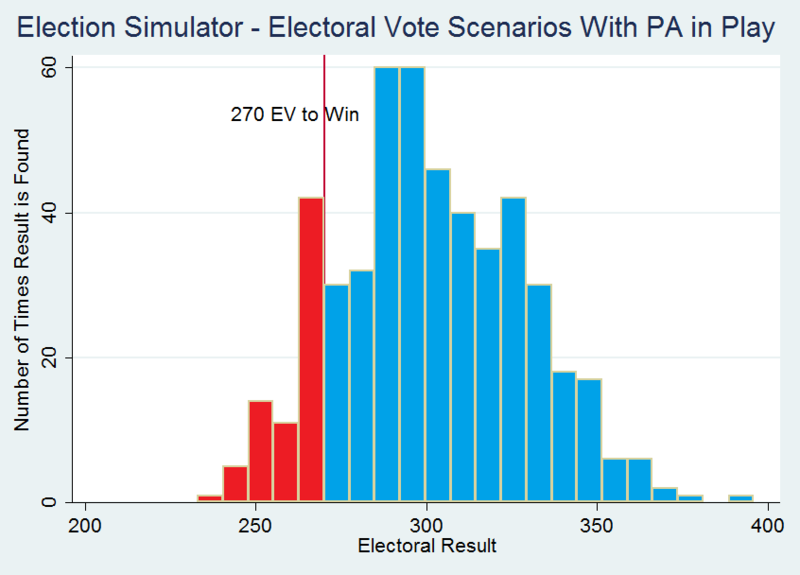 With Pennsylvania a win for her, she wins the election 467 times out of 500 simulations, or 93.4% of the time. These simulations only become reality if Clinton supporters make every day count between now and Election Day. There is no easy path to the presidency, certainly not for Hillary Clinton. Every call, every door knock, every tweet, every vote, matters. Melissa McEwan contributed to this article.